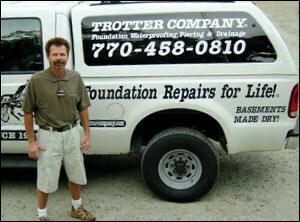 While you can’t always prepare for the damage water can do to your home and foundation, you can always rely on Trotter Company to fix it quickly, and fix it right. We’ve been leading the foundation repair service industry since 1929, gaining the loyalty of over 20,000 customers in the Atlanta area and being innovative every step along the way. Our foundation repair services run the gamut from waterproofing and emergency maintenance, to long-term solutions like foundation piers, floor stabilization, and complete wall rebuilds. We know what you expect from your run-of-the-mill foundation repair contractor, and we’re happy to report that we’re nothing like them! On-time arrivals, on-time departures, smiling, satisfied customers–that’s how we do things at Trotter Company. In fact, if our customers aren’t thrilled with our work, we’re surprised! Our foundation repair services in Atlanta and surrounding areas fall into three main categories: drainage services, waterproofing services, and structural services. All in all we offer every solution you need for making certain your home is protected against further water damage. As one of the largest foundation repair companies in the United States, we’ve spent the last eighty years building our own foundation our satisfied customers! If you’d like to become one of our satisfied customers, call us today at (770) 458-0810, or fax us at (770) 458-0968.